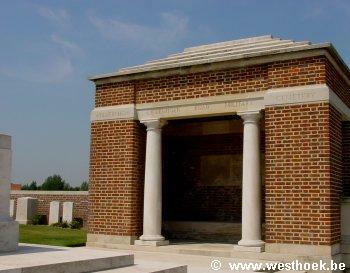 Wulverghem-Lindenhoek Road Military Cemetery is located 13 Km south of Ieper town centre, on a road leading from the Kemmelseweg N331 connecting Ieper to Kemmel. From Ieper town centre the Kemmelseweg is reached via the Rijselsestraat, through the Lille Gate (Rijselpoort) and straight on towards Armentieres (N365). 900 metres after the crossroads is the right hand turning onto the Kemmelseweg. (Made prominent by a railway level crossing). 2 Km after passing the village of Kemmel lies the left hand turning onto the Hooghofstraat. 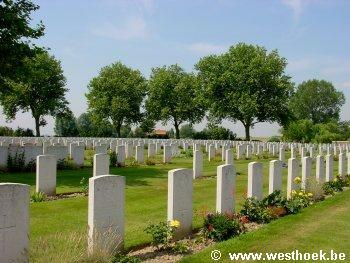 The cemetery lies 1.5 Km along the Hooghofstraat on the right hand side of the road. 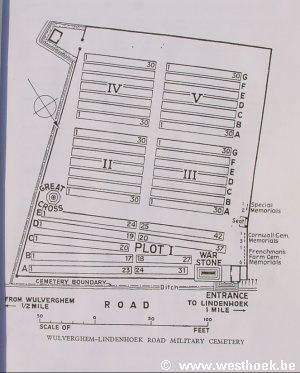 The cemetery was begun in December, 1914, by four battalions of the 5th Division; it was called at first Wulverghem Dressing Station Cemetery. It was used until June, 1917, and again in September and October, 1918. 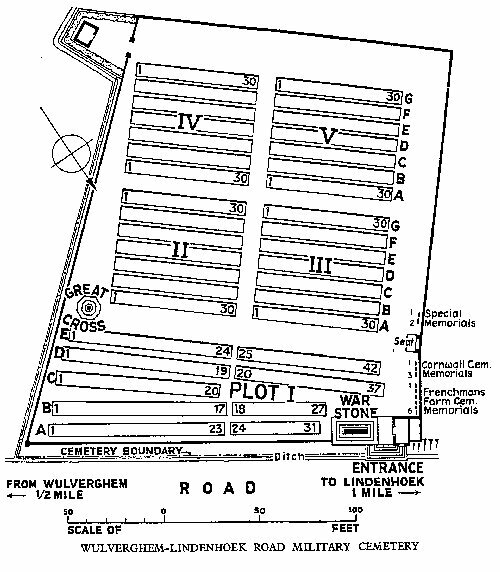 At the Armistice it contained 162 graves (of which 49 were Canadian), now forming Plot I; and Plots II-V were then added by concentrations from the surrounding battlefields. These new plots represent almost the whole period of the War, and in particular the defence of the Kemmel front in April, 1918 and the final advance of September, 1918. There are now 1010, 1914-18 war casualties commemorated in this site. Of these, 352 are unidentified and special memorials are erected to 2 soldiers from the United Kingdom believed to be buried among them. 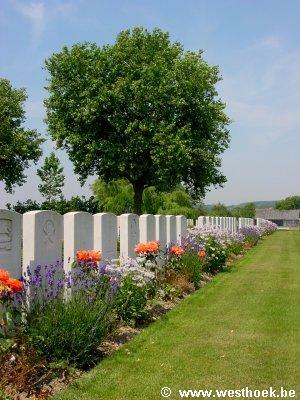 Seven other special memorials record the names of 5 soldiers from the United Kingdom buried at Frenchman's Farm, and 2 buried in Cornwall Cemetery, Messines, whose graves were destroyed in the fighting of 1917-18. The cemetery covers an area of 3,998 square metres and is enclosed by a brick wall. AUCKLAND CEMETERY, MESSINES, on the North bank of the Douve between Messines and Wulverghem, contained the graves of twelve New Zealand soldiers (including nine of the 2nd Auckland Regiment) who fell on the 7th June, 1917. 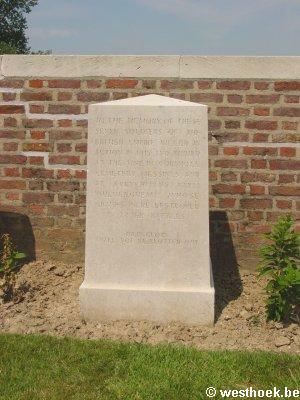 CORNWALL CEMETERY, MESSINES, 137 metres West of Auckland Cemetery, contained the graves of 21 soldiers from the United Kingdom (including 20 of the 1st D.C.L.I.) who fell in December, 1914-January, 1915. 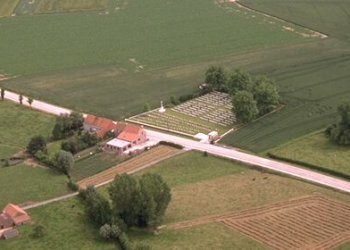 FRENCHMAN's FARM, WULVERGHEM, nearly 2 kilometres North of the village, contained several groups of graves; and in them were buried 29 soldiers from the United Kingdom and one French soldier who fell in 1914-15. NEUVE-EGLISE NORTH CEMETERY was on the Neuve Eglise-Lindenhoek road. It contained the graves of 20 soldiers from the United Kingdom who fell on the 2nd and 3rd September, 1918, and of whom 16 belonged to the 1st Royal Irish Fusiliers. NEUVE-EGLISE RAILWAY HALTE (or RAILWAY SIDING) CEMETERY was at the light railway station on the South side of the village. It contained the graves of 14 soldiers from the United Kingdom (including seven of Queen Victoria's Rifles) who fell on the 5th January, 1915.